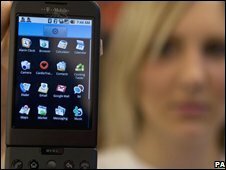 Rob Coombs, director of mobile marketing at Arm, said he expected to see the first devices running the version of Ubuntu by the time of the Computex show in June. The devices will be based around the Arm7 architecture and, in particular, the Cortex A8 and A9 processors. "It's significant in that it is taking Arm onto larger screen formats," he said. The resultant netbooks were likely to sport screens up to 25cm (10in) across and be able to run good quality video, web browsers, and the well-known suite of Open Office programs, said Mr Coombs. Equally, he said, these netbook devices would have the long battery life enjoyed by many mobiles. "They'll be for people who want a small internet-centric device," he said. In a statement Jane Silber, of Canonical, Ubuntu's commercial sponsor, said: "This is a natural development for Ubuntu, driven by the demand from manufacturers for an ARM technology-based version." Small form-factor notebooks have proved hugely popular with many people looking for a small device that they can use to go online while out and about. The interest in the market sector is being driven by devices such as the XO laptop from the One Laptop Per Child project and the Eee machine from Asus. Arm produces chip designs that firms such as TI, Qualcomm and many others turn into processors that power 70-80% of the world's mobiles. Arm-designed chips also drive many smartphones such as the G1 - the first phone powered by Google's Android software. The tie-up with Arm builds on Canonical's announcement in May 2007 that it would develop versions of Ubuntu specifically for low-cost note books.